It’s with great pleasure, I welcome our next addition to the team. 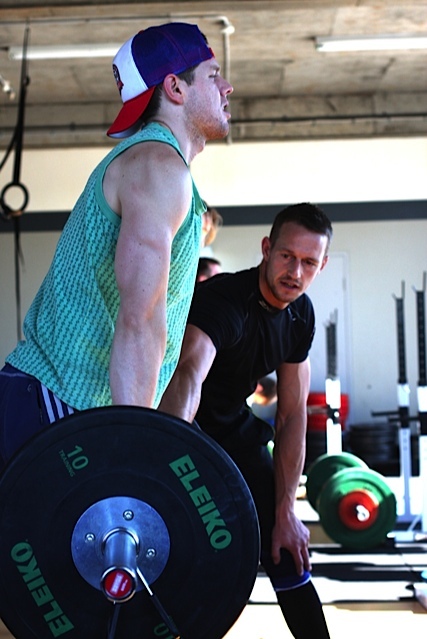 Simon is our Chief Boxing Instructor, Assistant Strength & Conditioning Coach and Club Weightlifting Coach. Has the same training ethos and methodology to that of mine. Has the high standard of coaching qualifications not just personal training qualifications, that make me feel comfortable leaving our members in someone elses hands. You guys, the clients, will like, get on with, and find incredibly motivating. Simon seemingly dropped out of the sky a couple of weeks ago. With the determination to perform at his peak everyday, Simon has achieved national qualifications in Strength & Conditioning and is also a certified Sports Power/ Weightlifting Coach. He has been a boxing trainer for over 5 years and been lucky enough to train under professional boxers both in the UK and here in Sydney. His dynamic approach to coaching has helped many people learn new skills and developed strong, fit, athletically minded individuals. As well as being involved at all levels of our Sweat+Tears group training program, Simon is available for 1 on 1 training at $85 per hour. You can book one on one sessions with Simon through Joe’s Garage Gym website (under PT Bookings) or call us on 8021 3690. We want you! Participate in our Halo Trial! Your Mind: Best Friend or Worst Enemy?